The 1992 North American Free Trade Agreement (NAFTA) and its side agreement, the North American Agreement on Environmental Cooperation (NAAEC), are by far the most innovative of all the 680 agreements analysed. Together they include 48 environmental provisions that were unprecedented in the trade regime at that time. They also had a systemic impact on the entire trade regime, as the average number of environmental provisions really took off after their conclusion. US domestic politics has notoriously given a decisive push to these regulatory innovations. In the early 1990s, following the GATT dispute related to dolphin protection, a large coalition of US environmental groups pressured President Bush to address environmental concerns in trade negotiations. These environmental groups were actively supported by labour unions, for whom environmental issues were a convenient way to denounce weak regulations and lousy law enforcement in developing counties. Under this joint pressure exerted by environmental and labour groups, Bill Clinton announced that he would not sign the NAFTA implementing bill unless side agreements on labour and the environment were also concluded. 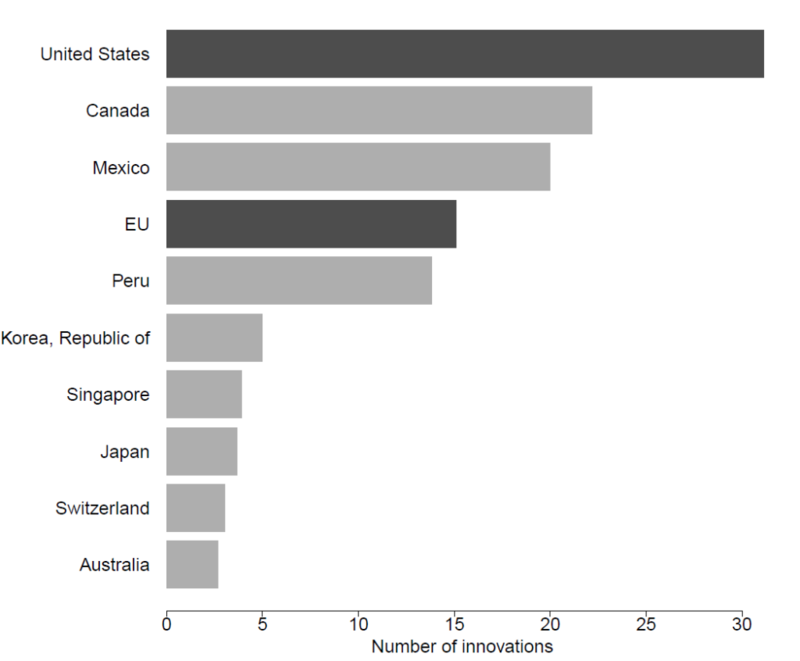 Graph: Number of legal innovations per countries according to the TREND dataset. The second most innovative agreement was also concluded by the US: the 2007 agreement concluded with Peru, containing 18 regulatory innovations. Here again, domestic politics can also explain this exceptionally high number. At the time of the ratification of the US–Peru agreement, the Democrats had just gained control of both the House and the Senate. Under this pressure coming from the Congress, the Republican administration agreed to revise its trade policy and to strengthen the environmental clauses typically included in its trade agreements. Other highly innovative agreements include the Lomé agreements and the Single European Act. These cases of regulatory innovations are much less documented in the academic literature than NAFTA and the US–Peru agreement. Yet, the fact that the most innovative agreements were either signed by the US or the EU suggests that they share certain preferences and enjoy a similar bargaining power, conductive to regulatory innovations.